I should start off this post with a disclaimer: I am a total eyeshadow junkie. To be more accurate, I am a total eyeshadow palette junkie. There is so much potential in a good eyeshadow palette, and I love when I can use it for days and never create the same look. 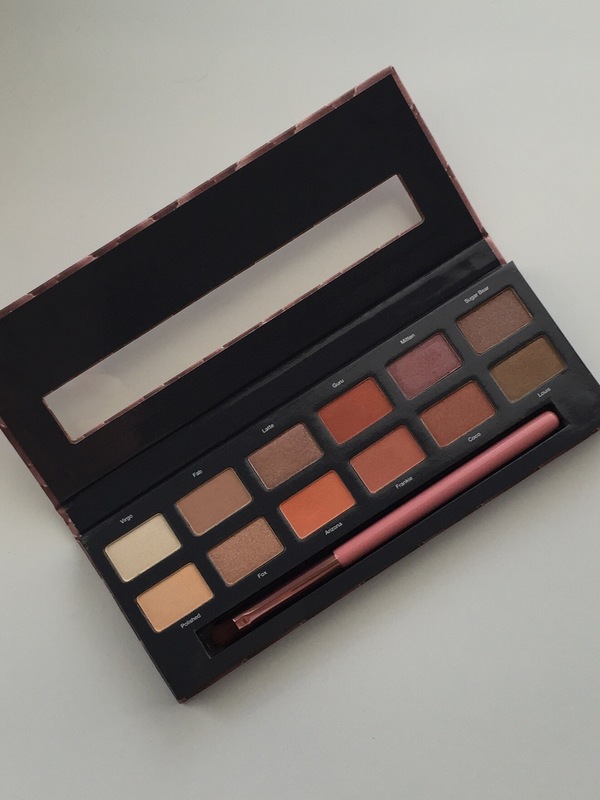 I also love warm-toned shadows, especially in late summer/early fall, so I was so excited to see the Miss Fabulous palette pop up in Ulta stores. This 12-shade palette is a collaboration between Jenny Fox (Miss Jen Fabulous), a long-time YouTuber who is famous for her nail tutorials as well as makeup-related videos. It retails for $20, like Ulta’s other eyeshadow palettes, and can be found in stores and online. Now to be honest, I’d never watched her videos before. I searched out her channel after seeing the palette on Ulta’s website, and I was hooked. I loved her down-to-earth product reviews and tutorials, which made me want the palette even more. The only problem though, was that some of the reviews weren’t so good. People talked about lack of pigmentation, fallout, etc. I can overlook this–I feel like any time you read a lot of reviews of a single popular product they range from “no pigmentation” to “beautifully pigmented,” so I know that this has so much to do with our preference and frame of reference. (No, that was not supposed to rhyme.) But the palette is $20, which is a little higher than what I’d typically pay for a drugstore item, so I waffled on whether or not to buy this one. In the end, a combination of gorgeous warm tones and Ulta’s free gift (that promo ends today) sealed the deal, and I ordered the palette. I am so glad that I did. The colors are gorgeous, and even more importantly, I don’t have anything quite like it in my collection. It is a neutral palette, but instead of a range of browns, you get a range of burnt orange shades. They are all just a little bit smoky, which keeps them from being too intense for every day. The browns it does include are warm, and many have some light golden shimmer. There is a good mixture of matte and shimmer shades and it satisfies my requirement that the shades look different enough that I can create a variety of looks. It also comes with a brush that is great for packing on shadows, especially in the outer corner. 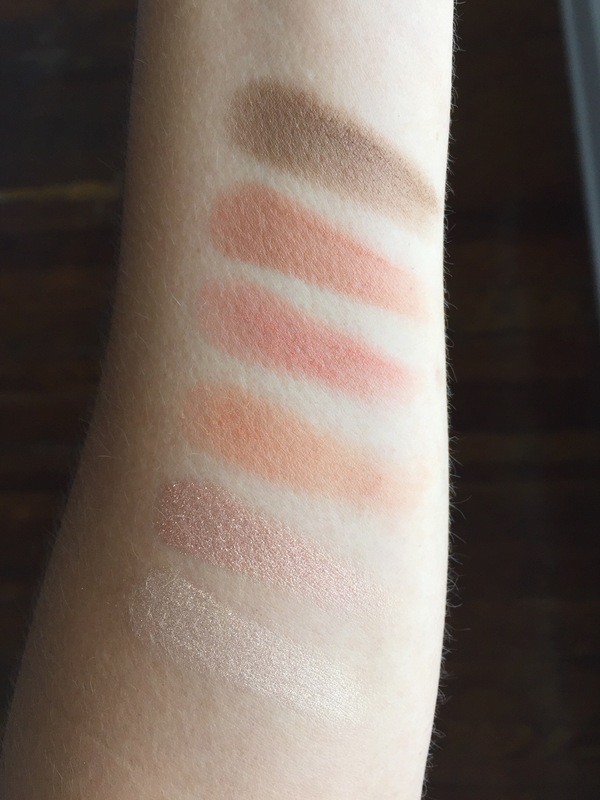 One thing to remember: whenever possible, don’t make decisions by swatches alone. Try the products on your eyes. 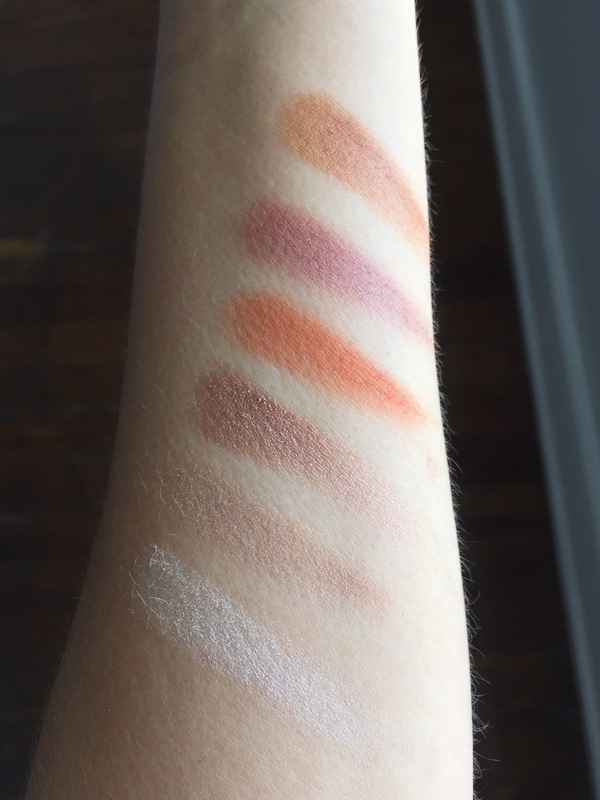 I was a little concerned when I swatched this palette, both in the store and at home after I bought it–the shadows were so soft that they kind of balled up under my fingers and were a little streaky, but I was slightly encouraged because they did blend out well. I watched a few of Jenny Fox’s tutorials on her palette and she said something very similar, that the shadows apply better than they swatch. She was so right. The next morning when I was actually applying them on my eyes with a brush, there was such a difference. They were exactly what I’d wanted them to be: mid-range pigmentation and nice, warm tones. The color payoff was accurate but allowed me to build to achieve the intensity I wanted. There was no streakiness at all. Moral of the story: If you’re really considering a product, you need to put it on your face. Ulta has a great return policy: if 80% of the item remains they’ll take it back, no questions asked. So if you really want to get a sense of how something works, buy it and try it out. I also discovered a bit of a hack for this palette. When I ordered it, I also ordered my first Maybelline Color Tattoo eyeshadows, in Bold Gold and Bad to the Bronze. I was obviously in a warm shadow frame of mind. One morning as I was getting ready to use the palette, I tried using the Color Tattoo in Bold Gold as a lid base. It looked gorgeous under Arizona, a mid-toned matte orange in the palette. It didn’t add too much shimmer, but it really upped the intensity and warmth of the shade. 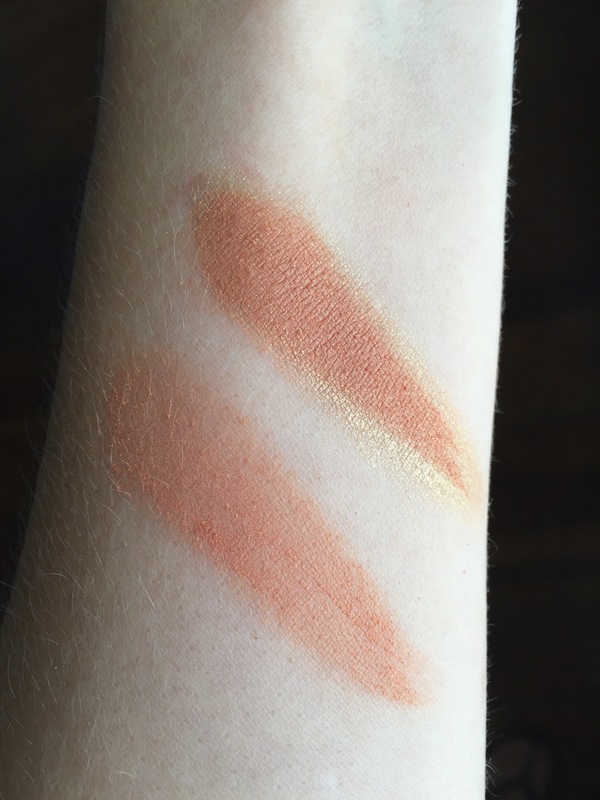 Here a photo of Arizona: it is swatched alone on the bottom, then over Bold Gold on the top. See what I mean? It just looks more opaque and intense with this base. I loved the effect and can’t wait to try more shade combinations. Their formula reminds me so much of the Cover Girl 8-shadow palettes that came out about a year ago and were marketed, not so subtly, as dupes for the Naked palettes. Both the Cover Girl and Miss Fabulous palettes have shadows that are solid but not overly pigmented, are soft, and kick up a lot of powder. Yet bloggers and YouTubers generally raved about the Cover Girl palettes and said they had a lot of fallout but they could look past that because they were so good for drugstore shadows. But one of the most common criticisms of the Miss Fabulous palette focuses on that same detail–the powderiness of the shadows. What accounts for the difference? I’d guess price and expectations. We’re used to bad drugstore shadows–stiff, very little pigment, unexciting shades–so when we get good ones, we’re excited, and even better, they’re only around $10! But we’re used to amazing high-end shadows, and the Miss Fabulous palette retails for $20, which places it out of a drugstore price range but under a high-end range. We don’t know what were supposed to expect from that. Now, I’m not saying that you should like it or not, buy it or not, and I’m not saying that we should not expect any product we buy to perform well and live up to its claims. If a product doesn’t do that, we have every right to criticize it. I’m simply saying that with Ulta-brand (or any store-brand) beauty products, it can be hard to know how to evaluate it, or what standards it should be expected to meet. Realistically, for $20, should we expect an eyeshadow palette to be at the level of Urban Decay or Anastasia Beverly Hills, which retail for over twice the price? Some of you might say yes, some might say no. Both are totally valid responses. So I guess what I’m saying is as you’re making the decision whether or not to buy a product, or as you’re reading reviews online, try to figure out what your expectations are, and if they’re the same as the expectations of the reviews you’re reading. I’m not saying we should have lower standards for drugstore products. I love drugstore makeup, I constantly choose it over high end, and I expect it to perform at a very high level. I’m saying that without realizing it, we often do have different expectations, and realizing that can help us make better decisions FOR US. Final Word: Personally, I love this palette. Is is everything I wanted it to be. I love warm, rusty browns and the smoky plum shade (Mitten) is just gorgeous and unique. It is perfect for everyday–it gives me interesting, but still neutral, looks. I’ve worn it for the past three days and I get excited every time I open it. I do recommend using it with a primer–I’ve been using Elf’s $2 primer that comes in a tube, and it is one of my favorites. There will be some fallout, but not significantly more than I experience with other shimmer shadows, and it brushes away easily with a fluffy powder brush (I actually like to use my highlight brush, but go with whatever works for you). If you love warm shades and prefer shadows that are not too intensely pigmented, this would be a great palette for you. I highly recommend it.